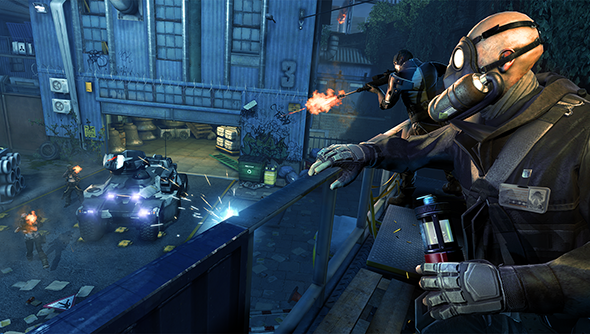 Splash Damage has kicked off the next phase of Dirty Bomb’s beta. The team-based multiplayer shooter and PC exclusive, set in a post-nuclear crisis London, has now migrated to Steam, and if you’ve played before, check your inbox for a Steam code. Our Steve got some hands-on time with Dirty Bomb last year, and had lots of nice things to say about it, and its colourful cast of near-future mercenaries. My experiences mirror Steve’s. There’s already a nice balance between straight forward action and objectives in mostly linear maps and smart level design and character diversity. It’s evocative of Brink, but also Team Fortress 2 and even earlier, breakneck paced shooters from the days of yore. And despite the setting, London after a nuclear catastrophe, the maps are surprisingly colourful and lively. Though there’s little time to admire the scenery, as gunfights are frenetic affairs that require you to be on the ball all the time, mowing down enemies and supporting your chums with healing machines and explosives. From today and until January 20th, every mercenary is available. After the 20th, progression will be reset and some characters will be locked. If you play during this time, however, Splash Damage will through some credits your way, so you can unlock a merc that you’ve grown fond of.